Winchester Auto Ranging Digital Gauge™ kit includes: gauge, adaptor, case versatile hook, N.I.S.T. cert. and extra filter. 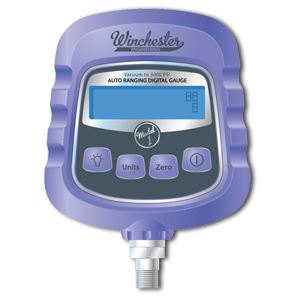 Winchester Engineering Model 1 high accuracy (.1% of reading) Auto Ranging Digital Gauge™ will replace the need to use many gauges of different ranges to achieve and maintain high accuracy. The performance, durability and design that you have become accustomed to having with other gauges but without the hassle or expense of needing multiple gauges to span ranges from vacuum to 3000psi. • Reads in 9 different units(PSI, bar, Hg, kPa, Inch Hg, Inch H20, MMHg, MMG20, mbar).